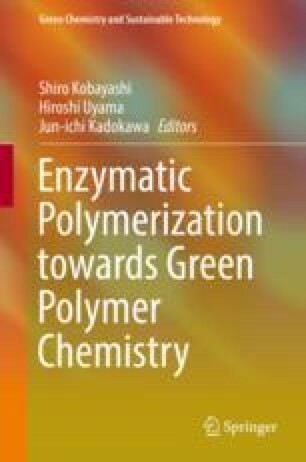 Synthesis of polyesters via enzymatic polymerization is described comprehensively in up-to-dated review manner, in which the polymerization is of polycondensation type using hydrolases mainly lipase as catalyst. First, characteristics of lipase catalysis are discussed: catalyst nature for green polymer chemistry including the catalysis mechanism, immobilization of lipases, role of surfactants for lipase catalysis, and so forth. Then, the lipase-catalyzed polycondensation synthesis of polyesters is argued according to the types of polymerization reactions: via dehydration of α- and ω-oxyacids and of dicarboxylic acids, via transesterification using carboxylic acid esters, and via ring-opening addition-condensation polymerization using cyclic anhydrides or cyclic esters as a monomer component. Other polymers like polyamides, polyamines, polycarbonates, and sulfur-containing polymers were synthesized by lipase catalyst. These reaction results indicate that lipase catalysts induce various polycondensation reactions to produce a variety of new polyesters. Further, protease which catalyzes primarily the peptide bond cleavage and bond formation catalyzed also the polyester production via polycondensation.